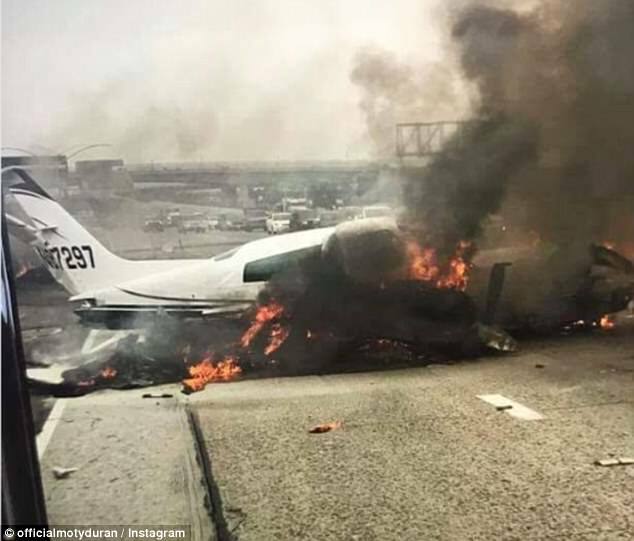 On June 30, 2017, about 0935 Pacific daylight time, a Cessna 310R multi-engine airplane, N87297, collided with the freeway following a loss of right engine power shortly after departing from the John Wayne-Orange County Airport (SNA), Santa Ana, California. The private pilot, and passenger sustained serious injuries. The aircraft was registered to Twin Props 87297, LLC., and operated by the pilot under the provisions of 14 Code of Federal Regulations Part 91 as a personal flight. Visual meteorological conditions prevailed and a flight plan was not filed. The flight was destined for Phoenix Deer Valley Airport (DVT), Deer Valley, Arizona. A witness located in a car on the north-bound freeway, captured the accident airplane in flight and subsequent impact sequence on video. The airplane was first observed in a right-wing low, 45-degree bank, in a slightly nose high attitude descending towards the freeway from the north. The wings leveled as the airplane crossed over the freeway about 20 feet above ground level. After losing sight of the airplane momentarily, the video continued with the airplane impacting the center median divide and opposing lane. The airplane exploded and caught fire. 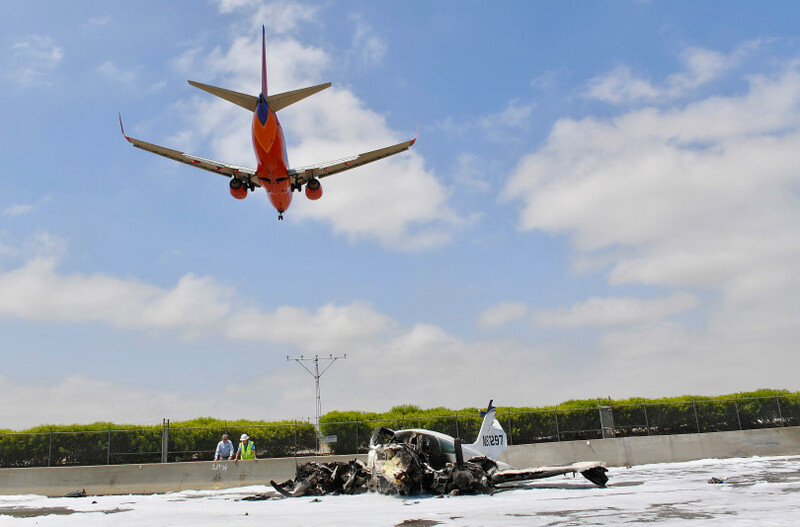 Radar data obtained from the Airport Surface Detection Equipment (ASDE-X) at SNA, showed the accident airplane taxi and then depart runway 20R. Shortly after takeoff, over the departure end of the runway, the pilot announced a mayday and entered the right traffic pattern for the runway. ATC replied by clearing the airplane to land on runway 20R. The airplane continued on the downwind leg of the traffic pattern and ATC informed the pilot that his landing gear was retracted. The pilot replied by stating he would put the gear down on final. The airplane was near the end of the downwind leg of the traffic pattern when the pilot stated that he lost engine power on the right engine. The airplane then turned right for the runway and the last radar returns from the flight track were near the accident site. According to the FAA inspector onsite, the debris field was about 150 feet long, crossing over both the north and south-bound lanes. 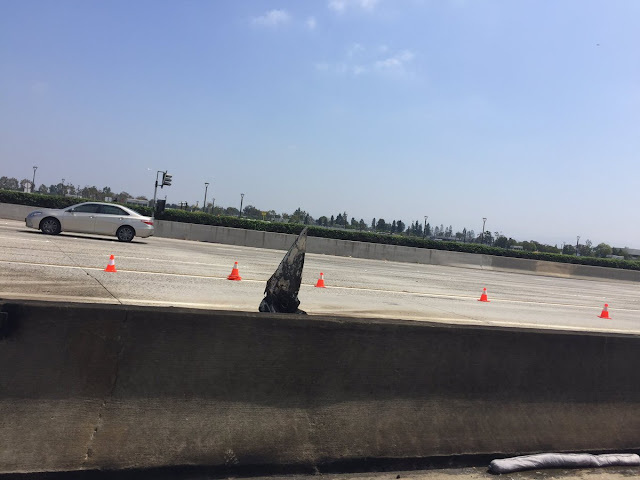 Impact marks and soot were found on the center median K-bar, and continued diagonally across the southbound lane to the K-bar on the edge of the freeway. The left-wing tip tank and left main landing gear were found further down the debris field in the northbound lane. The left elevator and right-wing tip tank were found on the southbound lane. About 150 feet down the debris field in the southbound lane was the main wreckage. The main wreckage was partially consumed by fire and both engines and propellers remained attached. The horizontal stabilizer separated from the wreckage and was found further down the debris field. 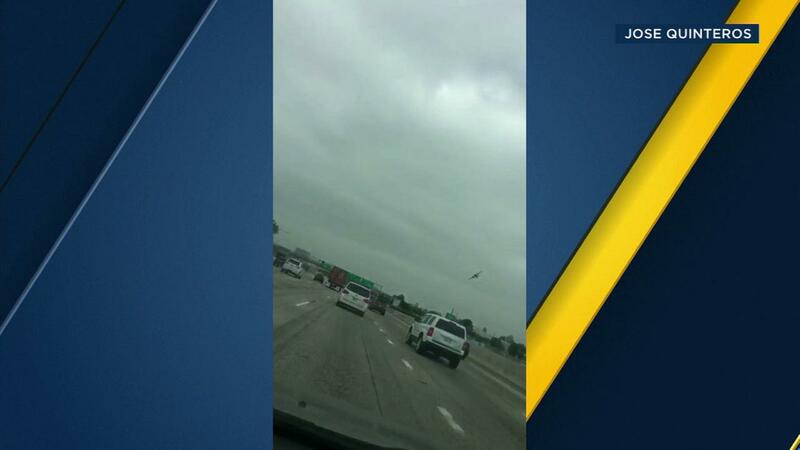 Airplane debris impacted several vehicles on the freeway. SANTA ANA (CBSLA.com) – A husband and wife who were critically injured while aboard a small plane that crashed on the 405 Freeway near John Wayne Airport have been released from a Santa Ana hospital and are expected to make full recoveries, a hospital official said. Francis Pisano, 62, and Janan Pisano, 55, both of Cota de Caza, were taken to OC Global Medical Center in critical condition with spinal fractures and cuts following the crash, which occurred about 9:35 a.m. on June 30. The couple were released Wednesday and were “on a path to full recovery,” according to the hospital’s Jeff Corless, who did not provide additional details. 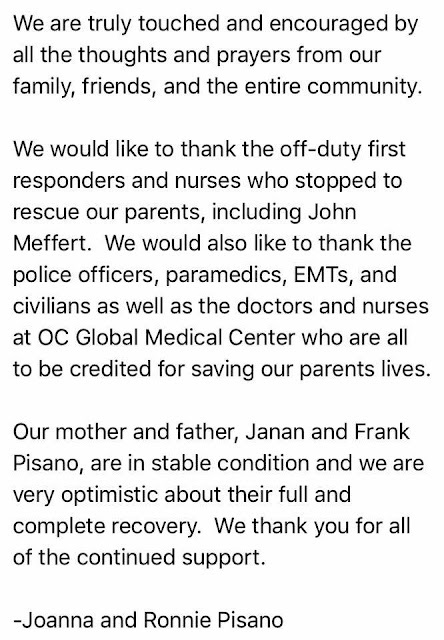 “From all of us at Orange County Global Medical Center, we send them off with all our care and support as they continue to recuperate,” Corless said. Janan Pisano released a statement through the hospital expressing the couple’s hope to return soon to normal activities, Corless said. State records show Francis Pisano is the owner of the Cessna that experienced engine problems shortly after takeoff, prompting him to try to return to the airport. Pisano radioed that he had lost one of his engines just after takeoff and then made a frantic mayday call to air traffic controllers seconds before the plane came down on the freeway north of the MacArthur Boulevard exit. “We got a mayday! We got a mayday! … I can’t make it back to the airport,” he could be heard saying. 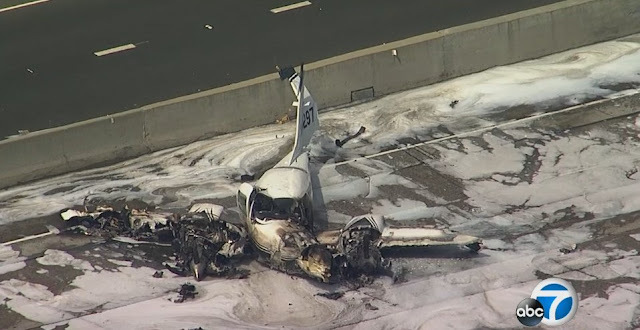 Pisano attempted to fly the aircraft to the airport westbound over the freeway, but it lost altitude and its tail clipped a center divider wall, according to the CHP. 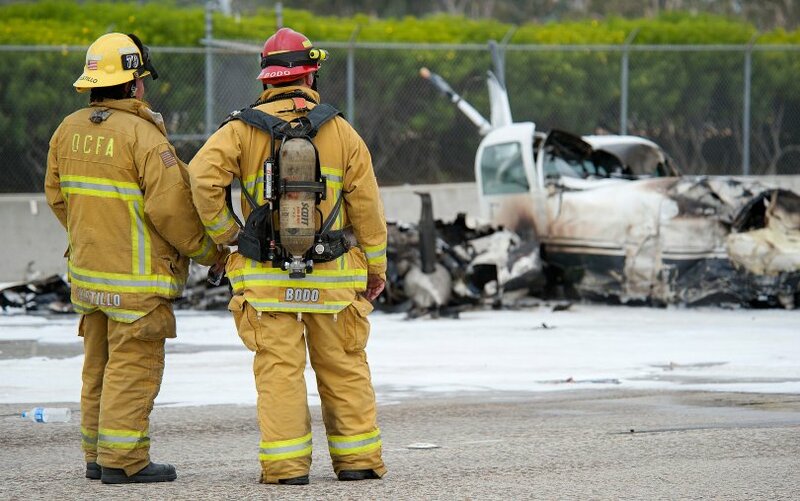 The Cessna continued westbound before colliding with off-duty Avalon firefighter John Meffert’s 2005 Mitsubishi. In the southbound lanes, the plane also collided with a 2008 Toyota with Uber driver Blackstone Hamilton, 51, behind the wheel. 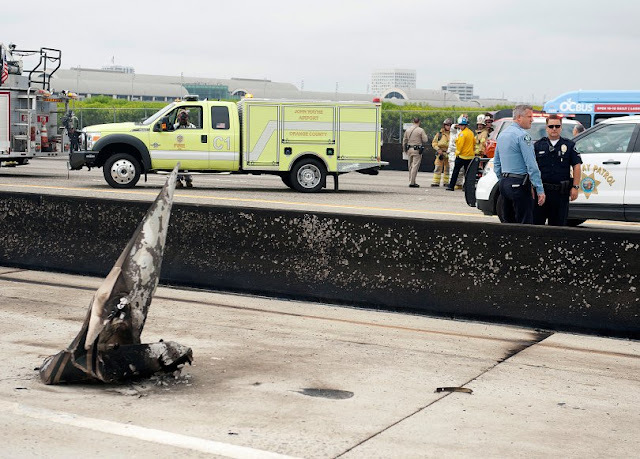 Ji-Yong Dong, 23, of Ontario, crashed a 2006 Toyota into the plane’s debris in the southbound lanes, as did northbound motorist John Triplett, 69, of Folsom, who was driving a 2008 Toyota. No one was injured other than the Pisanos. 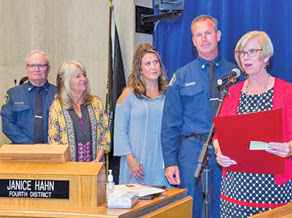 Supervisor Janice Hahn on Tuesday, July 11, honored Avalon Fire Department Capt. John Meffert, who is credited with saving two individuals trapped in the wreckage of a June 30 plane crash on the 405 Freeway. The City Council will reportedly honor Avalon Fire Department Capt. John Meffert at 6 p.m., July 18, in the council chambers at City Hall. Supervisor Hahn presented Meffert with an official County scroll in appreciation of his bravery. Hahn’s district includes the City of Avalon. Meffert was off-duty on June 30th when he was driving on the 405 freeway toward John Wayne Airport and noticed an aircraft flying unusually low. It was only seconds later that he realized the aircraft was headed straight toward him. The plane hit the front of Meffert’s car, but he was able to maintain control of the vehicle. The small plane carrying a pilot and passenger crashed a short distance away from him on the 405 freeway. Although the plane was nearly engulfed in flames, Meffert was able to pull both the passenger and pilot out of the wreckage and to safety. He was also able to perform an initial lower neurological check on the victims and direct other individuals that had gotten out of their cars to help. California Highway Patrol officials Monday identified the two people aboard a small plane that crashed on the San Diego (405) Freeway near John Wayne Airport. 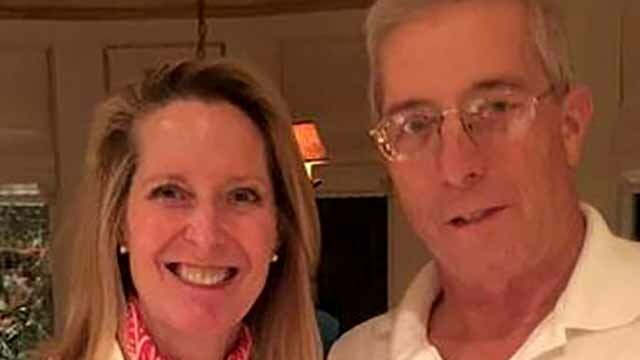 Lawyer and CPA company founder Francis Pisano, 62, and Jana Pisano, 55, both of Cota de Caza, were taken to Orange County Global Medical Center in critical condition with spinal fractures and cuts following the crash, which occurred about 9:35 a.m. Friday. The husband and wife are both expected to recover. According to hp-cpas.com, the Santa Ana-based CPA firm of Hoffski & Pisano was founded in 1982 by James B. Hoffski and Francis X. Pisano. “Originally specializing in taxation, the firm has expanded its areas of service to encompass all facets of accounting including compilation, reviews and audits; tax planning, research, compliance and representation before the US Tax Court, IRS and state and local taxing authorities with respect to both examination and collection matters; consulting, including estate and financial planning, business valuations and acquisitions, computer application and employee benefits,” the site says. 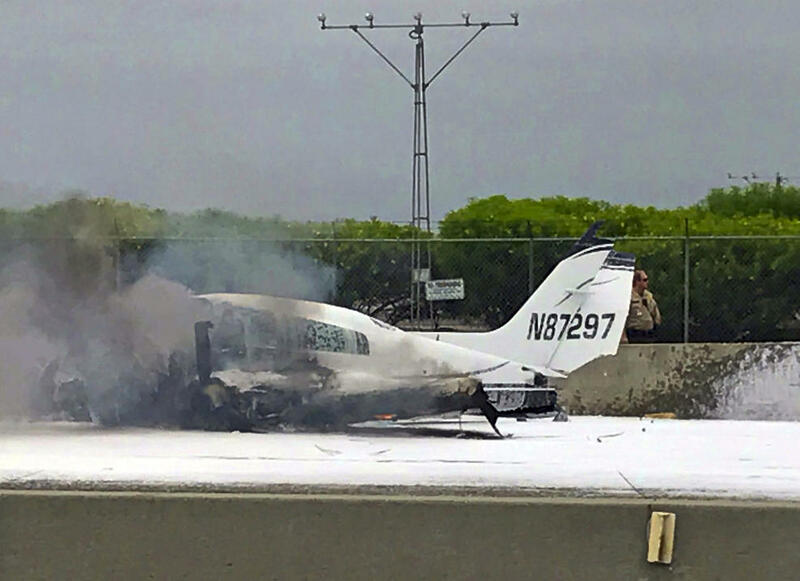 State records show Francis Pisano as the owner of the Cessna that experienced engine problems shortly after takeoff Friday morning, forcing Pisano to try to return to the airport but crashing instead on the freeway. 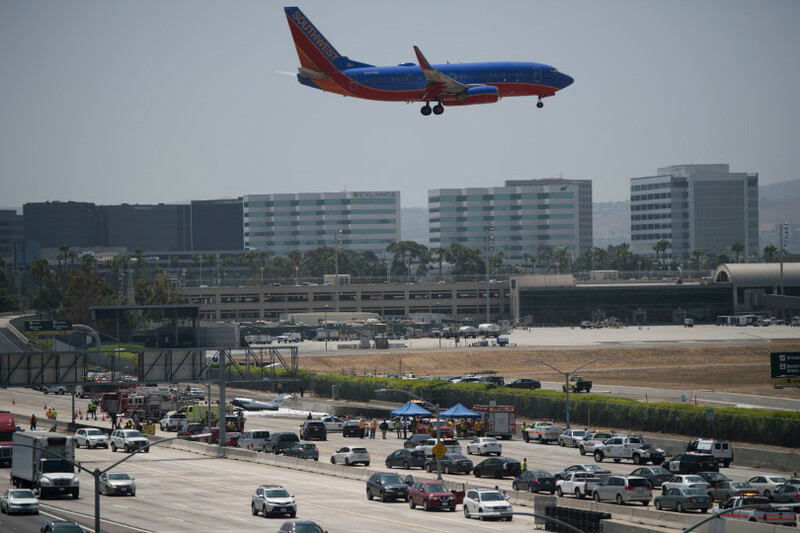 One of the plane’s engines lost power, so Pisano attempted to pilot it back to the airport westbound over the freeway, but the aircraft lost altitude and its tail clipped a center divider wall, according to the CHP. 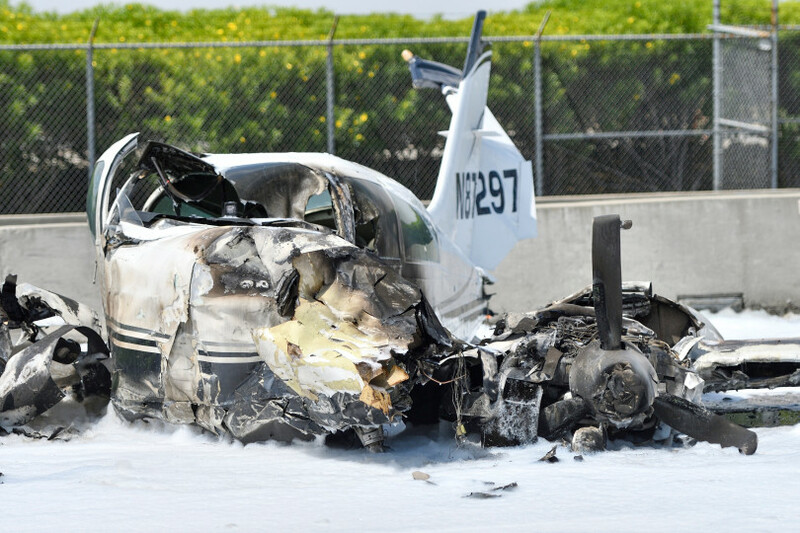 The Cessna continued westbound before colliding with off-duty city of Avalon firefighter John Meffert’s 2005 Mitsubishi. In the southbound lanes, the plane also collided with a 2008 Toyota with Uber driver Blackstone Hamilton, 51, behind the wheel. Ji-Yong Dong, 23, of Ontario, crashed a 2006 Toyota into the plane’s debris in the southbound lanes as did northbound motorist John Triplett, 69, of Folsom, who was driving a 2008 Toyota. No one suffered injuries other than the Pisanos. 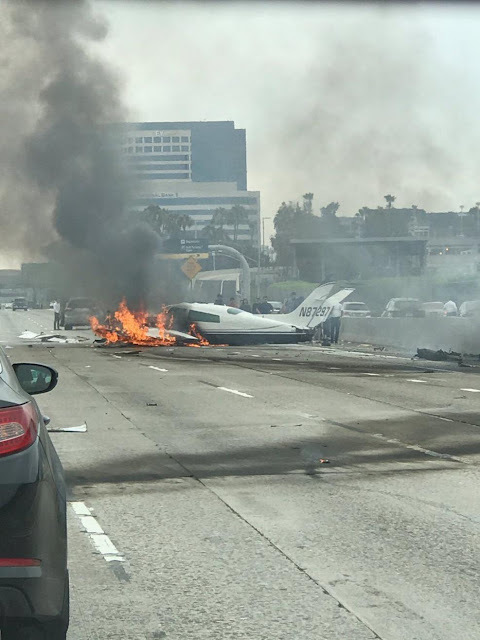 Francis Pisano radioed that he had lost one of his engines just after takeoff and then made a frantic mayday call to air traffic controllers seconds before the plane came down on the freeway north of the MacArthur Boulevard exit. 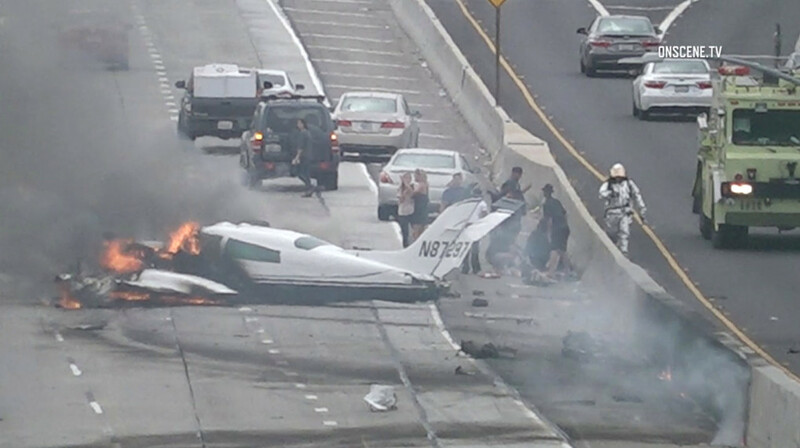 IRVINE — When a husband and wife crashed their plane on the 405 freeway on Friday, June 30, it was difficult to deduce what was going through the pilot’s mind, considering the unlikeliness of the incident. 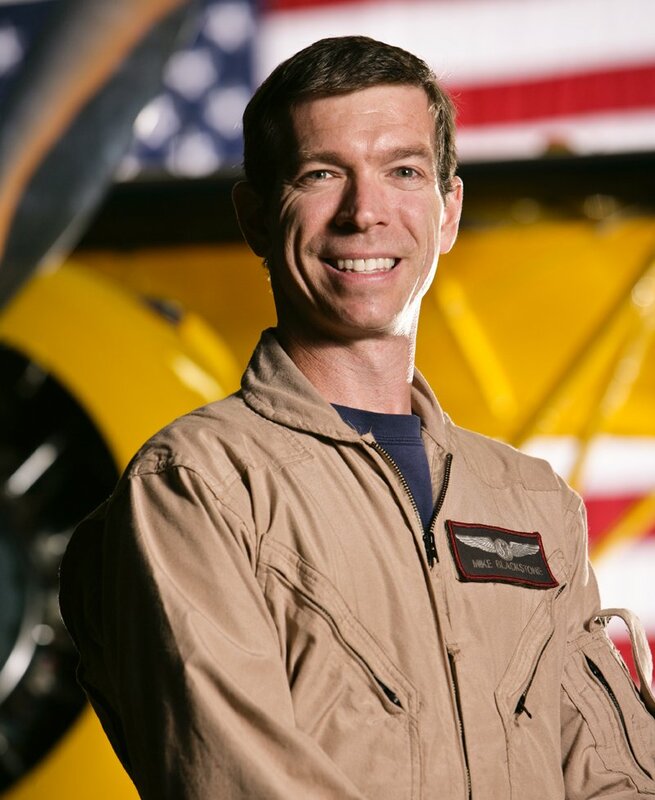 The situation Francis Pisano apparently faced – losing an engine on takeoff – is a worst-case scenario for pilots of twin engine planes, said Mike Blackstone, owner of Sky Thrills and Air Combat U.S.A., Orange County-based flight schools. At a high altitude, pilots have far more time to deal with an emergency. In the minutes after takeoff, Blackstone said, they may only have seconds. Once the engine is lost, the pilot can try to compensate by “feathering” the aircraft to reduce drag and try to glide the aircraft farther. That can be a difficult task as a plane pulls sideways and its speed drops rapidly. Blackstone estimated a pilot operating only on one engine would have half the thrust of a fully-operational twin-engine plane, while facing at least four times the drag. The combination would leave the aircraft feeling “twice as heavy,” Blackstone added. “(The failed engine) turns into a giant drag device, so the remaining engine is struggling to overcome that,” Blackstone said. While reaching an airport is the ideal choice, Blackstone said pilots faced with the prospect of an emergency landing will also look to long stretches of concrete, dirt roads, fields or golf courses. 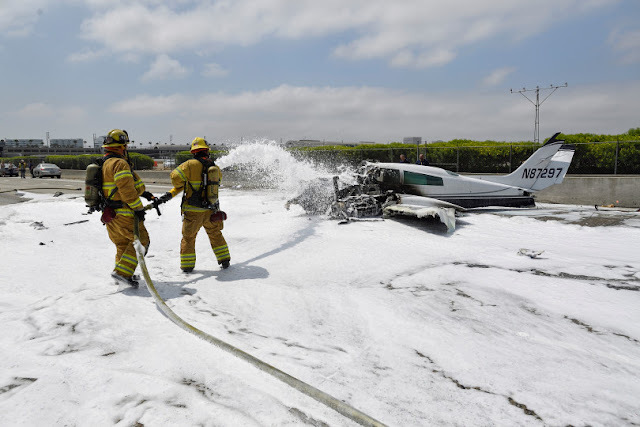 Pilots at John Wayne Airport routinely deal with the realities of nearby homes. The airport has been called one of the “scariest airports” in the country, largely because of a steep takeoff that aircraft are required to quickly execute to get high above homes and airport noise sensors. Despite the dramatic coverage that surrounds emergency landings, Blackstone noted that such incidents are exceedingly rare. 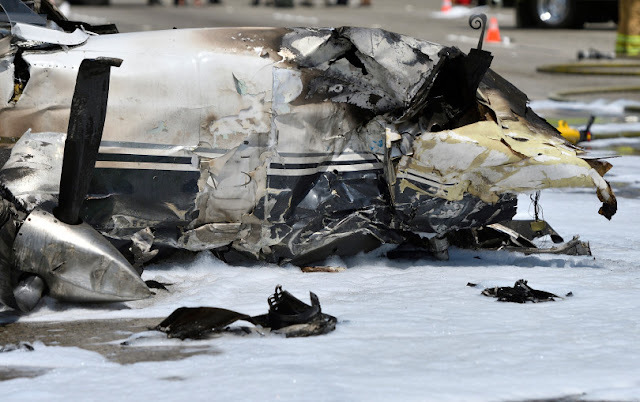 While he was unable to comment specifically on Pisano’s actions without knowing all the factors he was facing, Blackstone noted that no one outside the plane was injured or killed. The California Highway Patrol on Monday released new information about small plane crash that occurred on the 405 Freeway in Irvine last week. 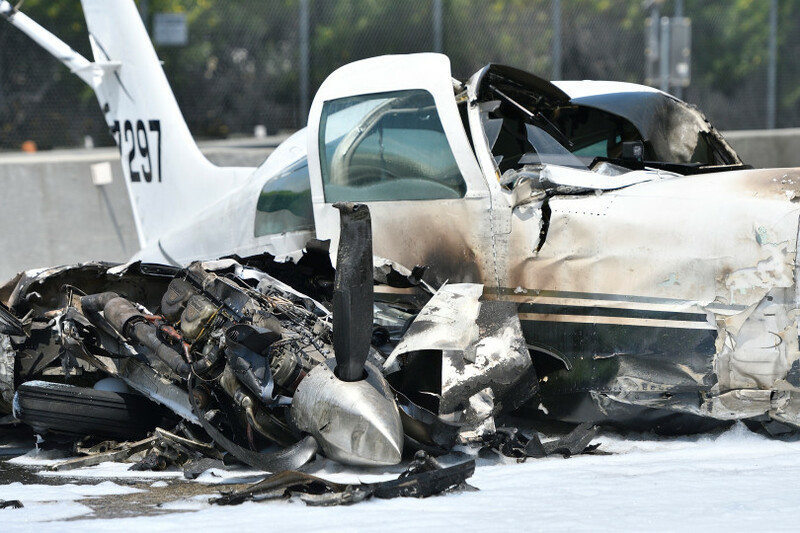 The Cessna 310R plane had just taken off from John Wayne Airport in Santa Ana when it lost power about 9:35 a.m. Friday. 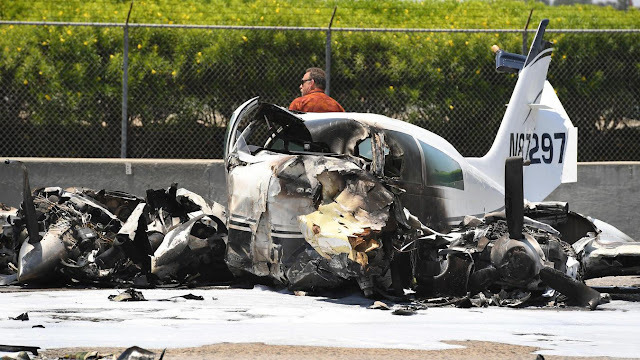 The pilot, Francis Pisano, 62, of Coto de Casa, tried to return to the airport along the highway, but the tail crashed unto the center divider, the CHP reported. Pisano frantically radioed a distress call before the crash, audio released the day of the crash showed. “We got a mayday! We got a mayday!” he said. His wife, Jana Pisano, 55, was a passenger in the plane. The plane caught fire, continued west and hit a vehicle on the highway driven by John Meffert, 47, of Rancho Santa Margarita. The plane then traveled across lanes and crashed into a Toyota driven by Blackstone Hamil, 51, of Thousand Oaks. Two other vehicles on each side of the highway crashed into debris from the plane crash. Several motorists stopped to help the victims in the plane, who were eventually taken to Orange County Global Medical Center with major injuries. As of Sunday, the Pisanos were in stable condition. None of the other people who crashed suffered injuries. The southbound side of the highway was closed for hours in the aftermath of the crash. 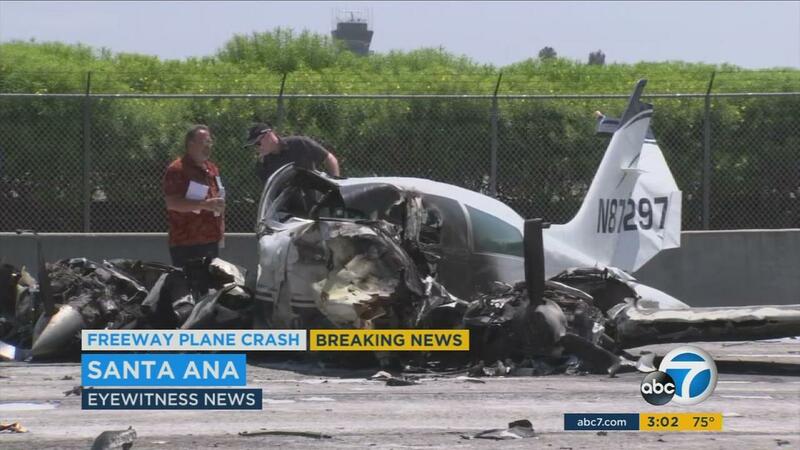 SANTA ANA, Calif. (KABC) -- The pilot of a twin-engine Cessna 310R that crashed down on the 405 Freeway in Santa Ana is in the hospital in stable but guarded condition Saturday while his wife, the only passenger on board, is in stable condition. 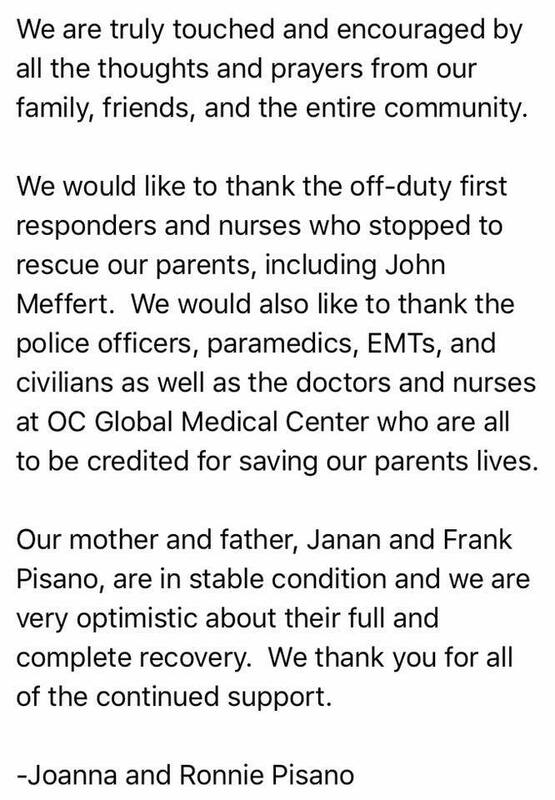 Both victims, who have not been identified, were being treated at Orange County Global Medical Center. The hospital public information officer, Jeff Corless, said the couple's prognosis for their recovery is positive. 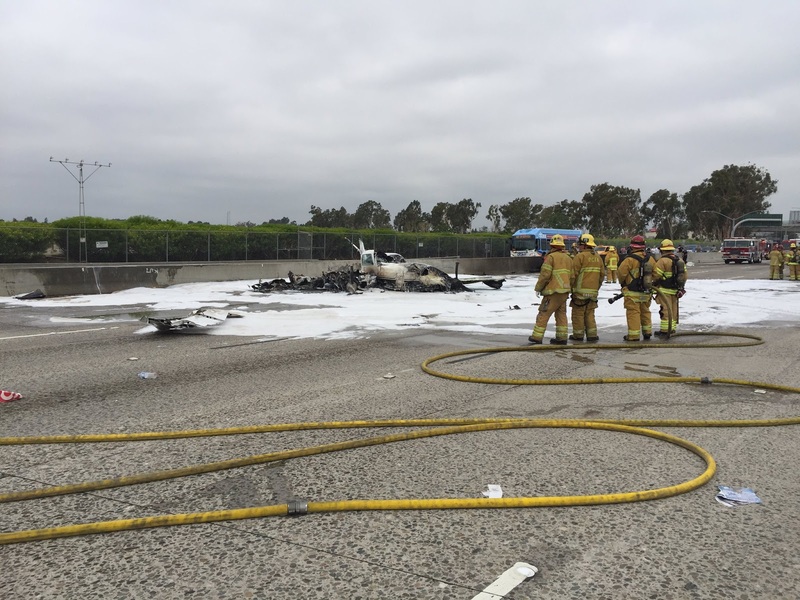 The small plane came down near the MacArthur Boulevard exit Friday morning, shutting down lanes for hours. Both directions of the freeway were back open to traffic on Saturday. Several people near the scene rushed to help, including an off-duty firefighter who's credited with pulling the victims out. 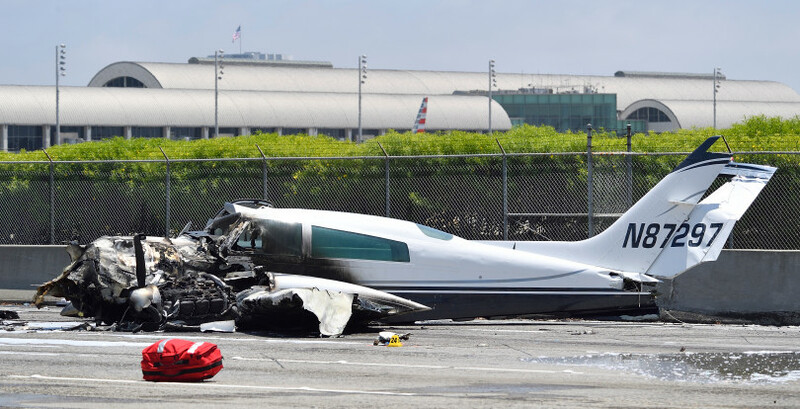 The pilot made a mayday call shortly after taking off from John Wayne Airport, telling the tower he lost his right engine. Luckily, no one on the ground was hurt and just one pick-up truck had minor damage when it was clipped by the plane. 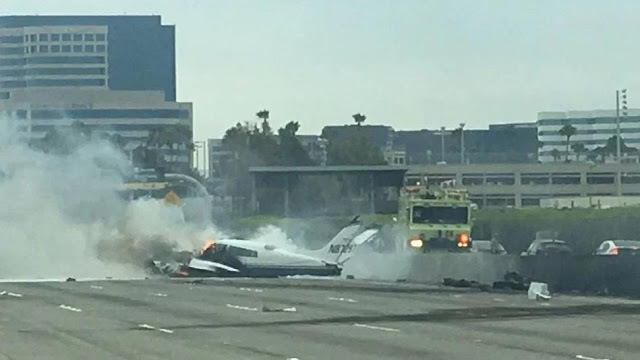 SANTA ANA, Calif. (KABC) -- ABC7 obtained the mayday call of the moments when a twin-engine Cessna 310 crashed on the 405 Freeway near John Wayne Airport on Friday. 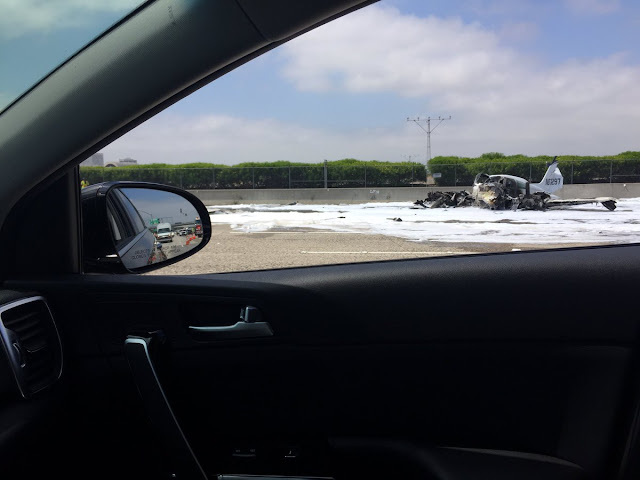 The plane went down about 9:30 a.m. near the MacArthur Boulevard exit. 04:07 Pilot: 87297, Mayday! Mayday! 04:15 Pilot: Try and make it back to the airport, 297. 04:18 Tower: 297, roger, 20 right, you're clear to land. 04:22 Tower: Cessna 650, make a full stop. 05:01 Tower: Your -- a gear appears to be up for 297. 05:04 Pilot: Yeah, I know, we're, we're still trying to get a little altitude. I'll put it down when I get to final, 297. I got -- I lost my right engine. 06:24 We just had an aircraft incident here, you're going to be out there for a while. 07:43 852, I'm not sure how to properly say this, but, uh, start thinking about divert, uh, indefinite closure, um, disabled aircraft in the vicinity of the airport, not in a good way. 07:58 Oh no, we're sorry to hear that, um, we will, uh, plan on Ontario then. 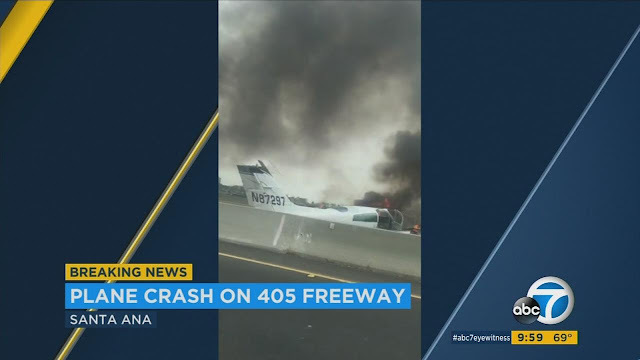 SANTA ANA, Calif. (KABC) -- Two people were injured after a small airplane crashed on the 405 Freeway near John Wayne Airport in Orange County on Friday, officials said. 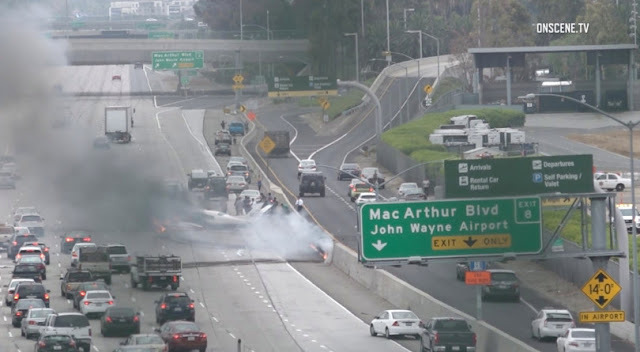 IRVINE – A small, twin-engine plane crash-landed on the I-405 freeway at MacArthur Boulevard Friday morning, June 30, erupting in flames and hitting one car and spraying debris on three others. The six-seat plane had two passengers; their conditions were unknown. 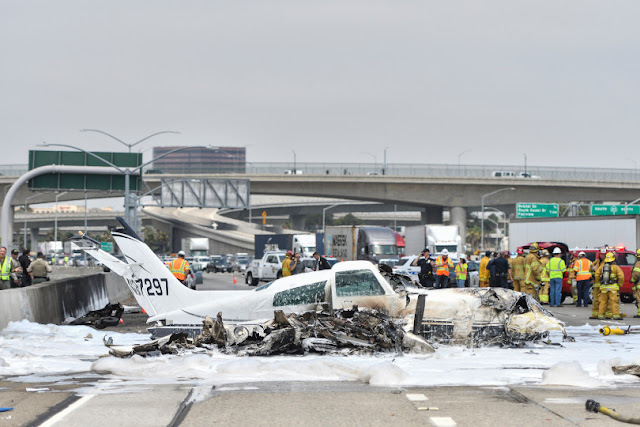 The pilot was a 62-year-old man, and his passenger was a 55-year-old female, said Paul Fox, an officer and a spokesman for the California Highway Patrol. They were conscious when first-responders arrived, and transported to a hospital. The pair’s vitals were good, said Capt. Larry Kurtz, of the Orange County Fire Authority. At 9:35 a.m., the Cessna collided with the one car, with debris hitting at least three others, Fox said. No one in the cars was injured. The plane came to a stop next to the concrete divider between the freeway lanes and the exit lanes leading to John Wayne Airport. The driver of the car struck by the plane is a fire captain from Avalon on Catalina Island and pulled the pilot out of the plane and administered first aid, Fox said. The passenger was able to get out of the Cessna on her own. 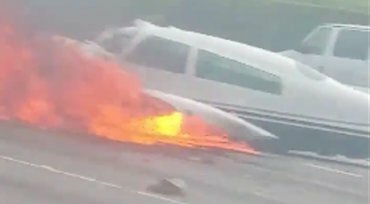 Video of the wreckage, taken shortly after the crash by OnScene.TV, shows the airplane’s cockpit and front section in flames and people spraying away with extinguishers to little effect. The plane had left John Wayne but soon declared an emergency and tried to return, said Ian Gregor, a spokesman for the Federal Aviation Administration. The Cessna 310 crash-landed on the southbound side of the freeway, short of the runway. The Cessna was registered two days ago, June 28, to a limited-liability corporation in Santa Ana, according to FAA records of the plane’s tail number. 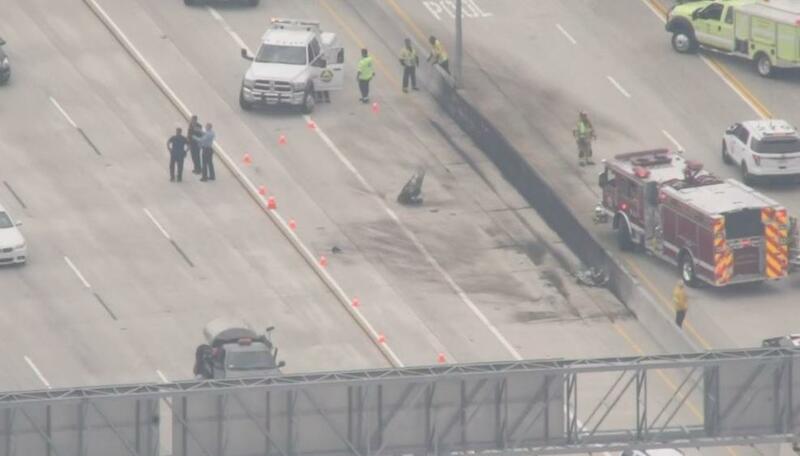 The accident charred the freeway surface and the divider. Andrew Granados, 28, works at nearby Prodex, which makes medical equipment, and was one of several dozen spectators on the Red Hill Avenue overpass taking pictures of the scene with his phone. From his office, he had heard a loud bang and the sound of something skidding along the roadway. 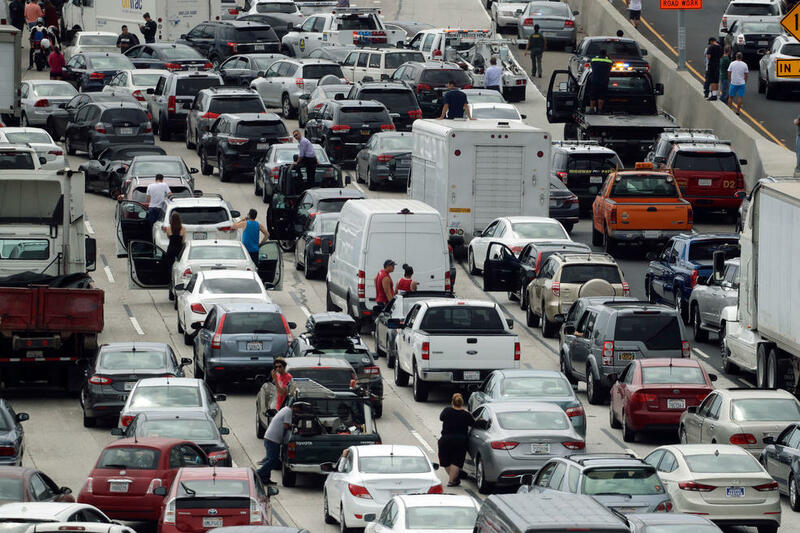 Traffic backed up on the 405 freeway. The southbound lanes were closed and expected to re-open at 5 p.m., although most of the northbound lanes remained open. The transitions to the 55 freeway were closed. Once the on-scene investigation is completed, the airplane will be towed away and the southbound lanes re-opened. 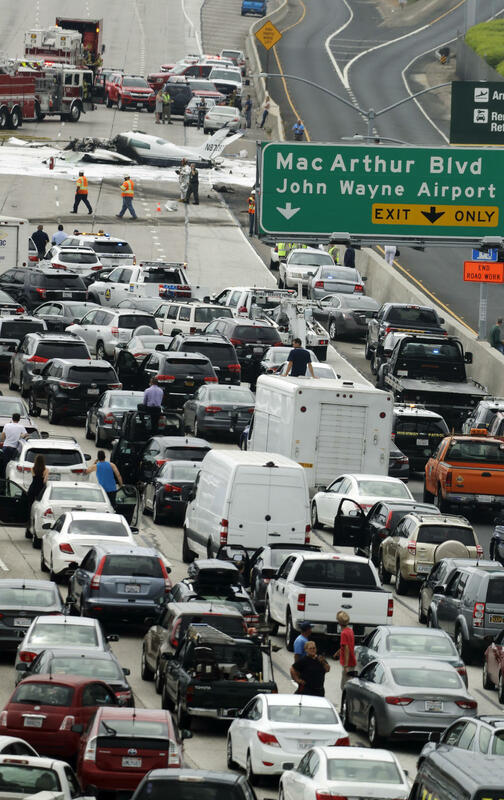 The airfield was closed to arrivals for about 45 minutes, with four flights diverted to Ontario International Airport before JWA started accepting arrivals again; they were to re-fuel and head back to John Wayne. One flight was diverted to Long Beach Airport. Three planes went to Los Angeles International Airport, re-fueled, and then headed back to John Wayne. Departures were not affected, said Deanne Thompson, a John Wayne Airport spokeswoman. After the crash, dozens of police cars, fire trucks and ambulances filled the southbound lanes, as northbound cars drove slowly past the wreckage. Owens said his son was to land at John Wayne this morning but was rerouted to Burbank. 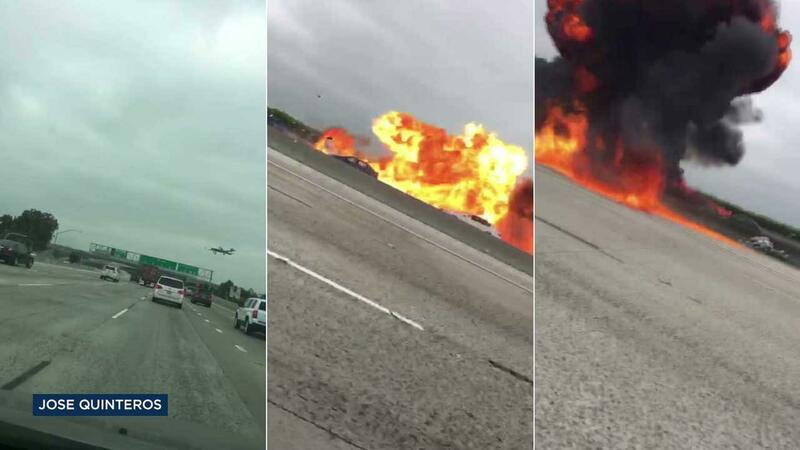 Two people were rescued from the fiery wreckage of a small plane that crashed Friday morning on the 405 Freeway in Orange County, clipped a pickup and skidded to a stop against a median as it burst into flames. The crash occurred at the MacArthur Boulevard exit ramp near John Wayne Airport in Santa Ana as the Cessna 310 arrived for a landing. Two people -- a man and a woman in their 50s and 60s -- were on the plane, which caught fire and produced a tower of smoke that could be seen for miles around by drivers and workers in nearby office buildings. Details regarding the victims' conditions were not immediately available. "It was a very surreal moment," said witness Korosh Torkzadeh, who works in the area. "I didn't really hear an impact. I thought the plane had actually made it to the airport, but then we saw it on the 405 Freeway." Torkzadeh said authorities' response time was "almost instant." Orange County Fire Capt. Larry Kurtz said authorities are attempting to confirm reports that a driver, possibly a current or former firefighter, stopped and pulled the two occupants from the burning wreckage. "As the first responders arrived, the individual in question really did extraordinary work helping to get these individuals out of the aircraft," Kurtz said. "He was very calm, very relaxed. Obviously, he's a professional." The plane went down around 9:30 a.m. just short of the runway, which is adjacent to the freeway, at John Wayne Airport, said Deanne Thompson, public information officer for the airport. 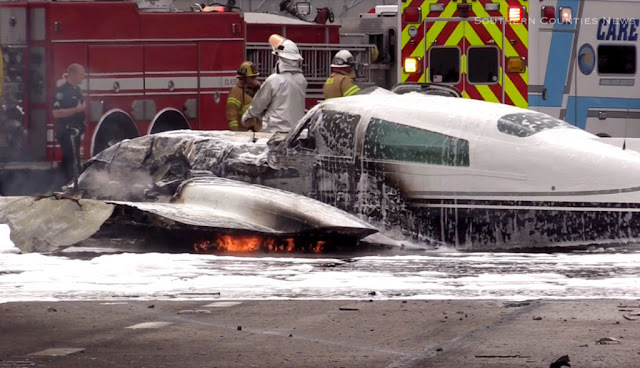 The pilot declared an emergency shortly after taking off from John Wayne Airport and was trying to return to the airport, according to the Federal Aviation Administration. Ray Spitzer was going surfing for his birthday when he saw the explosion. "We're going about 65, 70 mph and then we started slowing down quick, so I pulled the car over," Spitzer said. 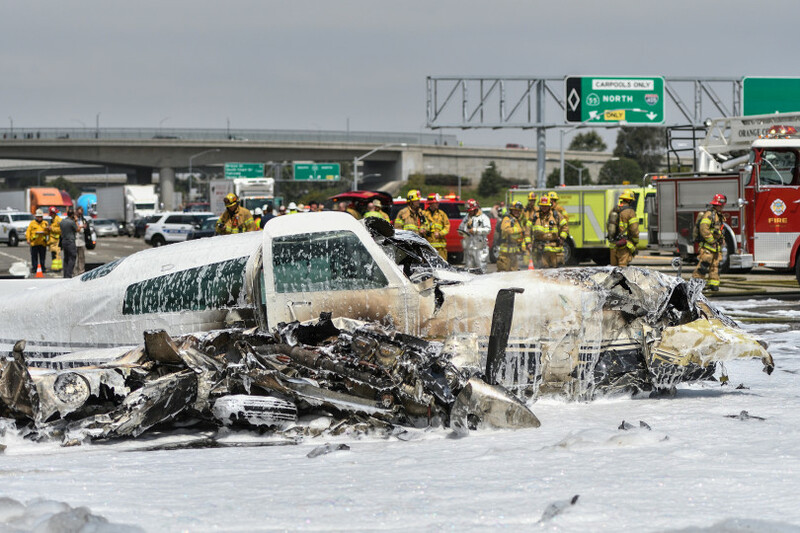 Witnesses said the plane appeared to crash on the northbound side of the freeway and ended up on the southbound side. Blackstone Hamilton said the plane clipped the rear of his pickup. "The rear-end of my struck was spun around," Hamilton said. "Thought at first it was a big rig that hit us. "I checked my passenger, made sure he was ok. We gave each other a hug that we were still alive. That's life, I guess." Authorities said three other vehicles were struck by either the plane or parts of the aircraft that littered the road as it skidded across freeway lanes. "There was debris all over the freeway," said witness Christian Romo. "It was insane. It was really scary. We were just praying instantly that they're ok and that their families are ok."
Romo said the plane tilted to its side and almost turned upside-down as it crashed into the freeway median. 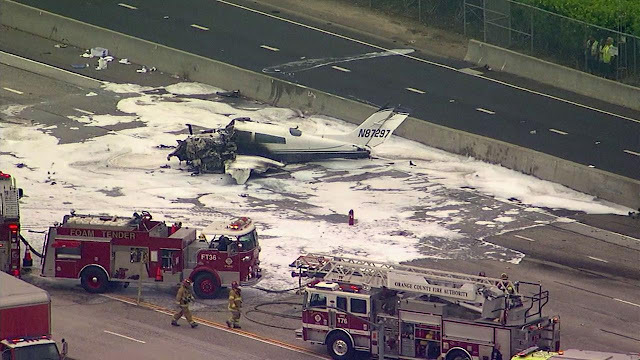 Several drivers stopped on the side of the road to help the plane's two occupants before firefighters arrived to douse the flames and treat the injured. 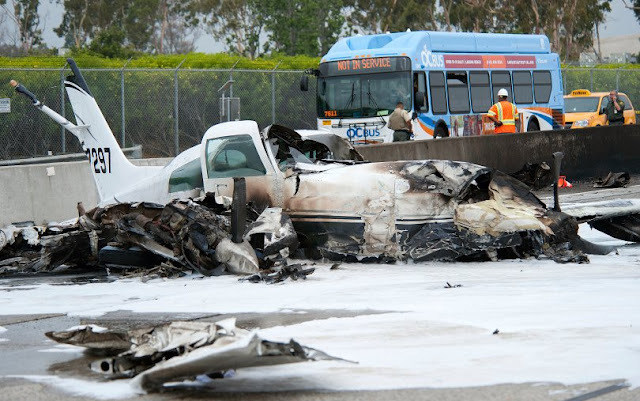 "The fact that a plane was able to land and only strike a single vehicle is extraordinary," Orange County Fire Capt. Kurtz said. 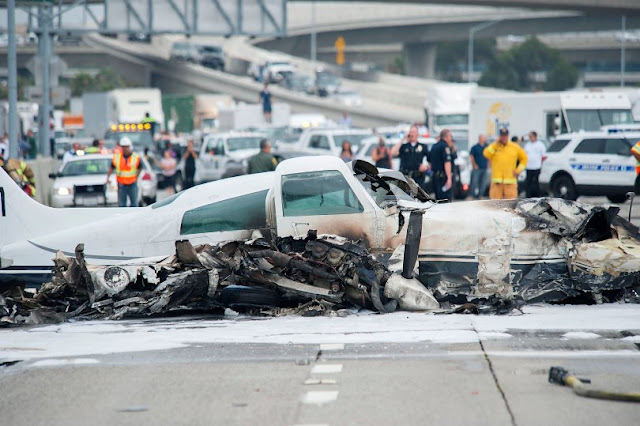 "Anytime you have a plane crash on a freeway, the potential for a great loss of life exists." Airport departures were not affected, but the airport was closed to arrivals until about 10:30 a.m., according to airport officials. Nine flights were diverted to nearby airports. The freeway was closed after the crash. Traffic was backed up for about eight miles in each direction near the airport. 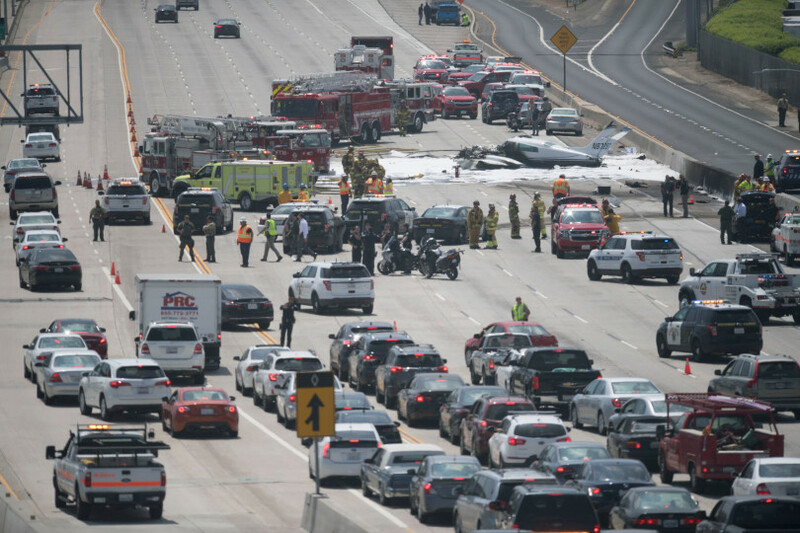 The plane wreckage is expected to remain on the freeway during the investigation, which will require lane closures Friday afternoon. 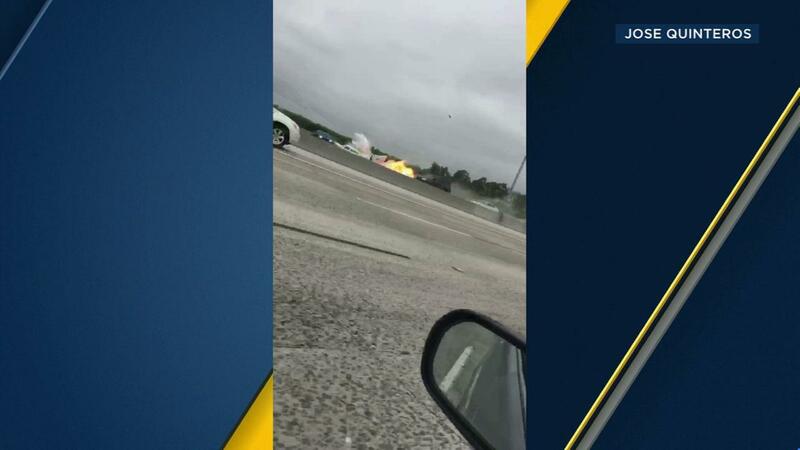 SANTA ANA, Calif. (KABC) -- As a small plane went down on the 405 Freeway near the John Wayne Airport in Orange County, a fireball erupted. Drivers who witnessed the crash slowed and many pulled over, some even running toward the flames to offer whatever help they could. Authorities said an off-duty Avalon firefighter pulled the two victims from the burning wreckage. Dramatic video shows drivers rushing to aid the two victims of a fiery plane crash on the 405 Freeway in Orange County. 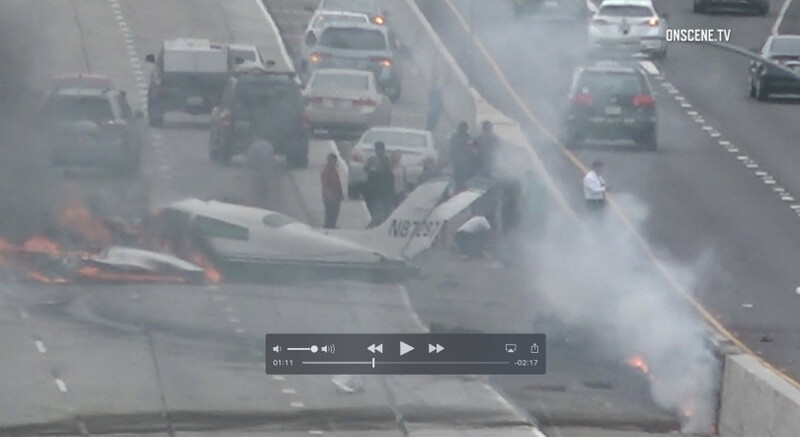 Dramatic video shows several people pulling the man who was piloting the plane away from the crash scene. "Call 911," one person rendering aid said. "Get on the phone." The pilot, who was covered in blood, was surrounded by civilian rescuers who worked to quickly assess his injuries. "Just breathe, just stay calm. Do not panic," one man can be heard telling the pilot. The female passenger who was also injured in the crash can be seen in the video leaning against the concrete freeway divider, being tended to by another good Samaritan. 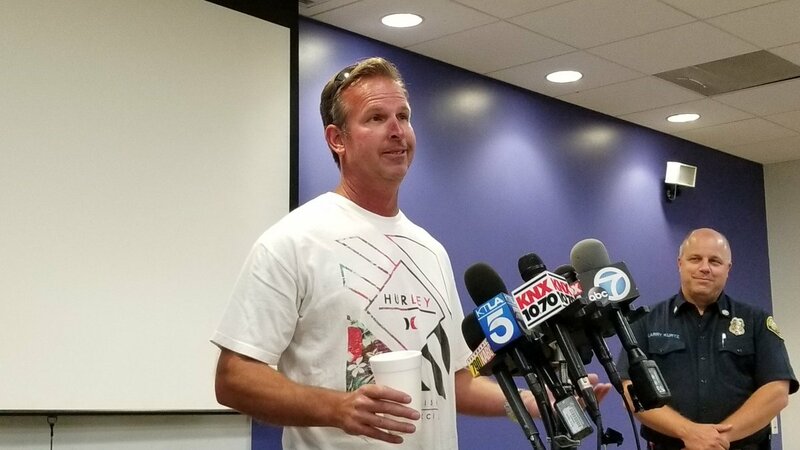 John Meffert, an off-duty Avalon firefighter, spoke out Friday on how he rushed to rescue a man and woman from a burning plane that crashed on the 405 Freeway in Santa Ana. "We just pulled them both out," one man said as smoke billowed from the wrecked plane. "I just came all the way from across the highway." The off-duty firefighter, John Meffert, spoke about the harrowing rescue during a Friday afternoon press conference. He said he was on the phone with his father while he was driving on the freeway. He said he told his father a plane looked really low as if it were going to hit his car. He said the car clipped his vehicle, he then saw the plane crash, got off the phone and ran to help the victims. Meffert said while he helped the man, two off-duty nurses were tending to the woman who was hurt. "I think the biggest thing was approaching the airplane and thinking, 'If I don't see movement, I'm staying back because I don't want to be a victim myself.' It wasn't until the wife, her head pops up, and again if she can be there, I can figure out a way to be there myself," Meffert said. He said the whole plane was engulfed, but there was little of the flames on the passenger side, which made it easier for him to get the couple out. One of the impromptu rescuers pulled out a knife and cut off the pilot's shirt to check his abdomen and chest for injuries. "You came in real hard," one man told the pilot. "I know," the bloodied pilot answered. 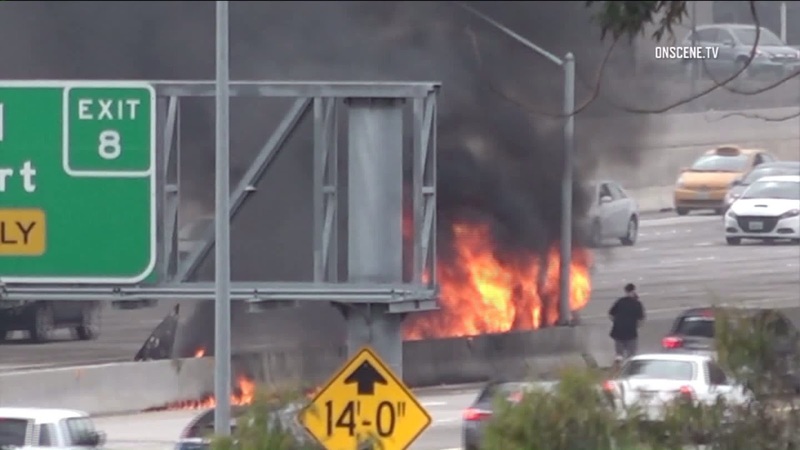 "Everyone started slowing down on the freeway, and it hit the northbound side and bounced into the southbound side and burst into flames immediately," one witness named Gabrielle said. Gabrielle said she and another driver got out of their cars and immediately ran across the street toward the flames. She saw an older woman who she believed had been inside the plane and the plane's pilot pulled from the burning wreckage. "They both are alive, talking," Gabrielle said. "They kept telling me, 'It's just me and my husband.'" Gabrielle described the victims lying on the ground on the freeway, covered in blood. 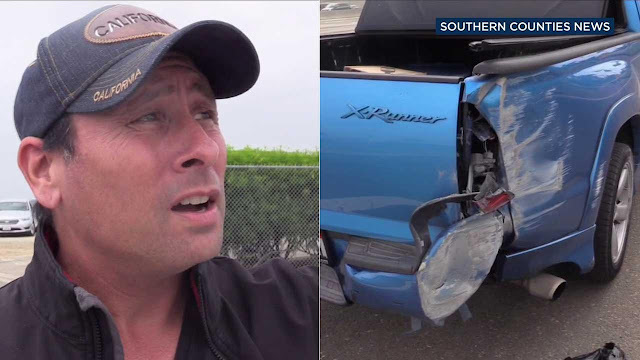 One witness, Cassie Corsaro, saw a man put his car in reverse on the freeway and go back to the scene of the crash, disappearing into the flames. "He was the first one," Corsaro said. The man tried to run "almost into the burning plane" to help, Corsaro said. That man may have been Meffert, the off-duty firefighter who pulled the two crash victims from the flaming wreckage. According to Corsaro, Meffert was not the only witness who attempted to render aid to the victims of the plane crash. "I know one guy ran back to his car to grab a bottle of water," Corsaro said. "Someone needed water." "They were doing everything that they could to help the people who were hurt," Corsaro said. 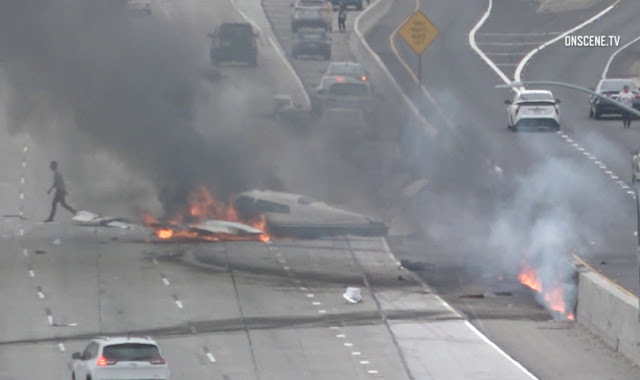 A small plane crashed on the southbound 405 Freeway near John Wayne Airport on Friday morning, leaving two people injured, sending smoke billowing above Orange County and forcing the closure of the freeway in both directions. 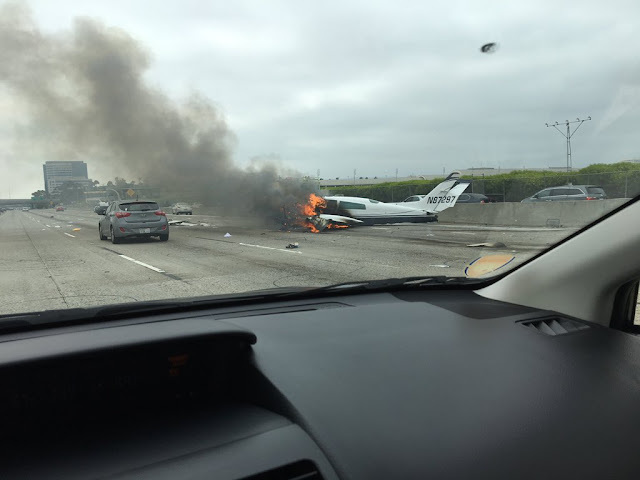 About 9:35 a.m., the twin-engine Cessna 310 crashed on the southbound 405, just shy of the runway. 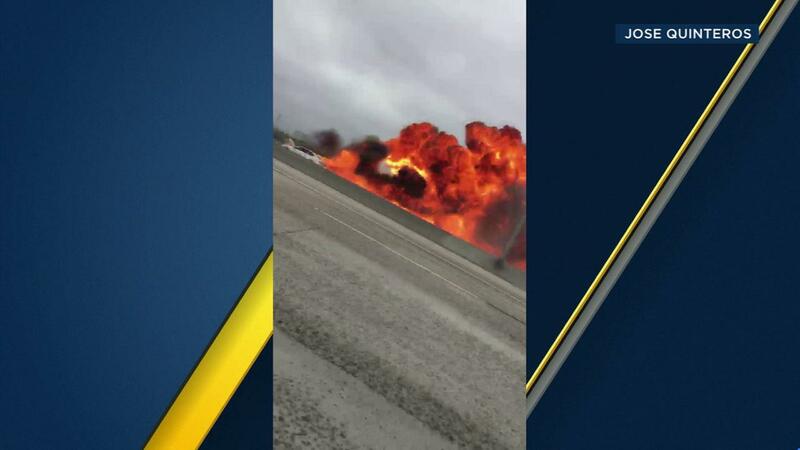 Two people were on board at the time, John Wayne Airport Director Barry Rondinella said at an early afternoon news conference. The occupants, a man and woman in their late 50s to early 60s, were removed from the fiery wreckage by an off-duty firefighter from Avalon on Catalina Island; both have been hospitalized with traumatic injuries, according to Orange County Fire Authority Capt. Larry Kurtz. 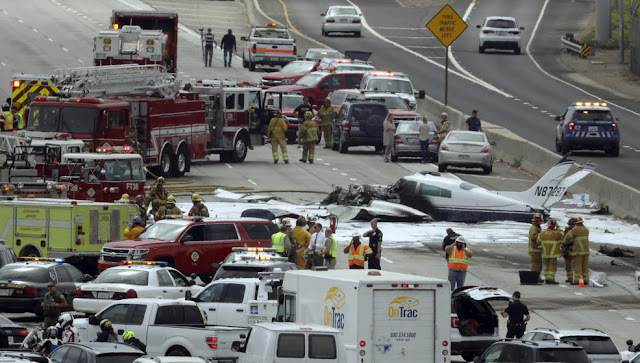 “They were designated traumas due the mechanism of injury from the impact of the plane on the freeway," Kurtz said. Both patients "had vitals" when they were removed from the plane, he said. Only the plane's occupants were injured despite multiple vehicles being struck by the plane or its wreckage, Kurtz said. The plane hit the freeway's center divider and caught fire before colliding into the right wall on the southbound side, according to California Highway Patrol Cmdr. Ryan Shackelford. One vehicle was struck by the plane's landing gear on the northbound side. Video recorded from a vehicle on the freeway showed black smoke billowing from the wreckage, with flames rising in the area of the center divider. 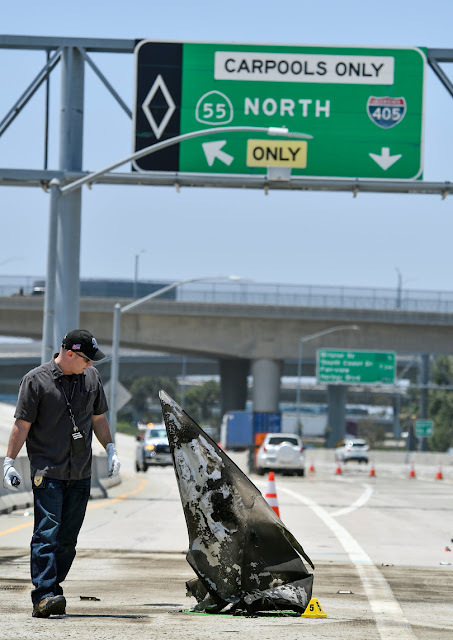 Debris was all over the freeway, and bystanders could be seen stopping to help two people, at least one of whom was lying on the freeway pavement. 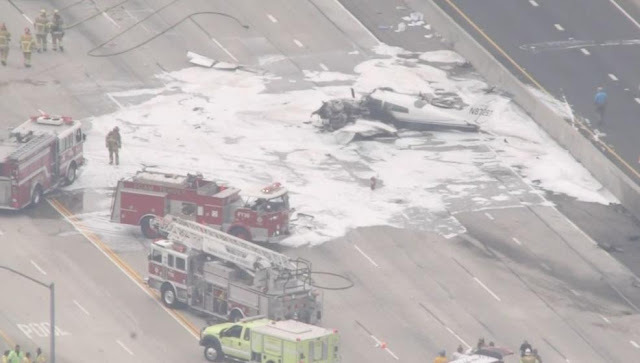 Orange County fire crews, aided by personnel from John Wayne Airport, used a foam system to put out the fire, essentially lobbing the foam over a fence and onto freeway lanes, according to Kurtz. He noted jet fuel is very volatile, creating a potentially "explosive situation." Nearly 40 firefighters responded, he said. It's unclear what caused the plane to crash. The Federal Aviation Administration and National Transportation Safety Board will be investigating. A CHP Multidisciplinary Accident Investigation Team is also out on the freeway diagramming the scene. 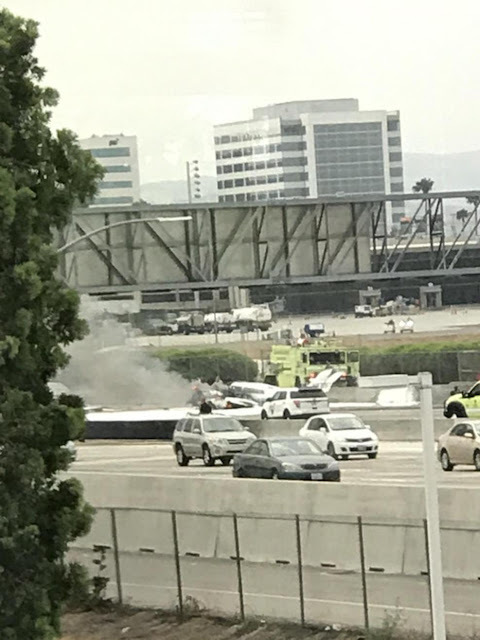 A preliminary statement from an FAA spokesman indicated the plane "crashed under unknown circumstances" short of Runway 20R as the aircraft was inbound to John Wayne Airport. The plane had taken off from John Wayne, declared an emergency shortly thereafter and was trying to return when the crash occurred. In an online recording of air traffic control radio communications, the pilot can be heard crying "Mayday, Mayday," explaining that he is trying to get more altitude and had "lost my right engine." 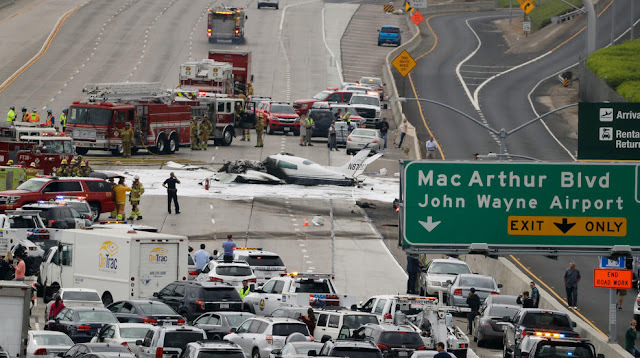 The plane's wreckage was on the southbound freeway near the MacArthur Boulevard exit, on the path that aircraft follow when landing at the airport. The airfield at John Wayne was closed to arrivals between 9:46 a.m. and 10:14 a.m., but departures were not affected, Rondinella said. About nine aircraft were diverted during that time. Rondinella encouraged those heading to the airport to check flights before heading there. Kurtz initially indicated no other vehicles on the freeway were struck before CHP officials confirmed that at least one was hit. 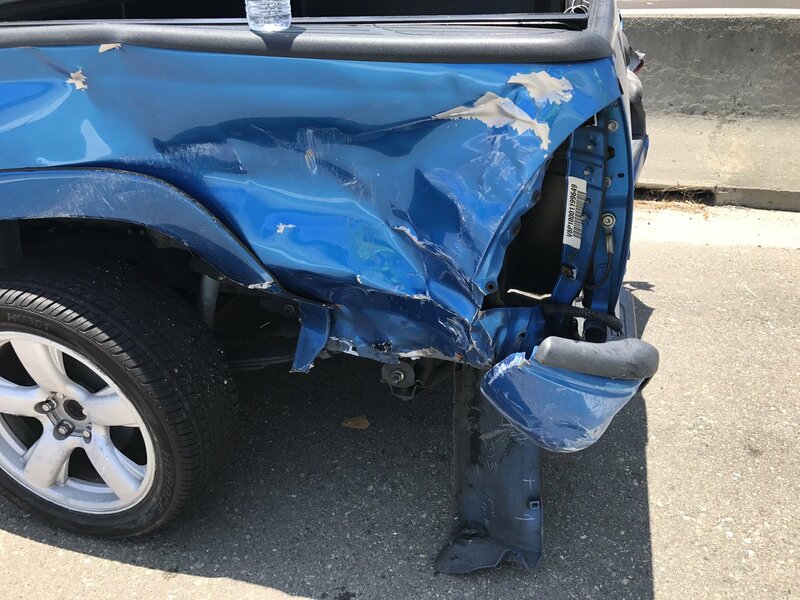 An Uber driver said his pickup truck was hit from behind. 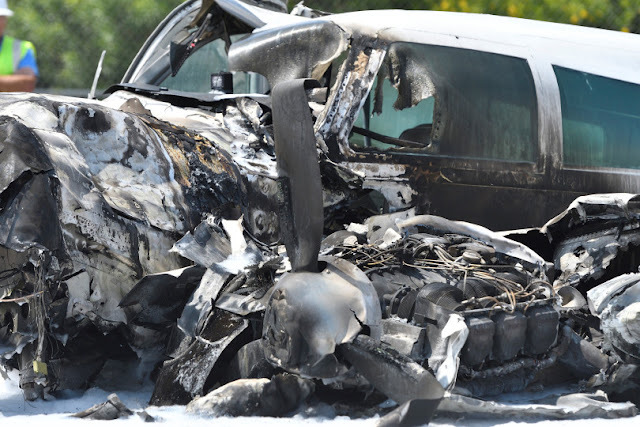 "I was struck by this Cessna ... by the rear end of my truck, was spun around, had a passenger in there. Saw flames all around us," Blackstone Hamilton told a freelance news photographer. "Checked my passenger, made sure he was OK and gave each other a hug – that we were still alive." Hamilton's blue Toyota Tacoma was left at the side of the road, severely damaged. The plane's wreckage, meanwhile, will not be moved until it can be examined by federal investigators, which will likely happen sometime in the afternoon, Kurtz said. “Right now this aircraft’s home is going to be here on the southbound 405 … for a little while,” he said. The investigation means likely severe traffic congestions in the area in the lead-up to the four-day Fourth of July holiday weekend. The southbound 405 is expected to be remain closed at State Route 55 until about 5 p.m., according to Shackleford. Until then, traffic will be rerouted to the northbound 55. Two lanes on the northbound 405 -- the HOV and No. 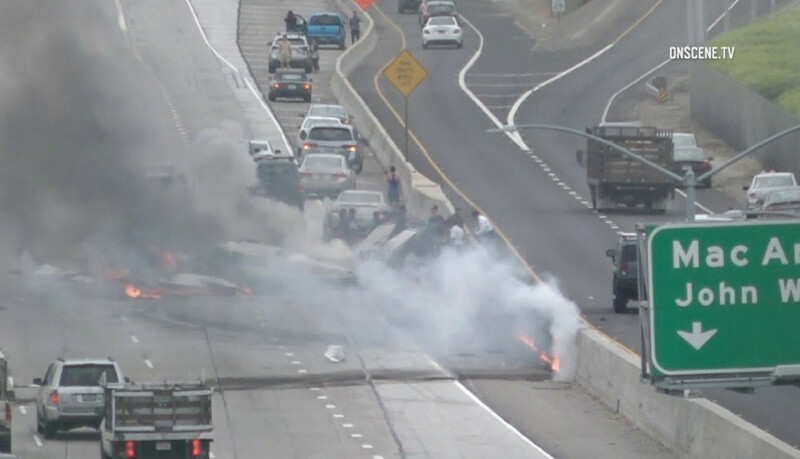 1 lane -- also remained closed, as did all southbound transition roads to the southbound 405, he said. 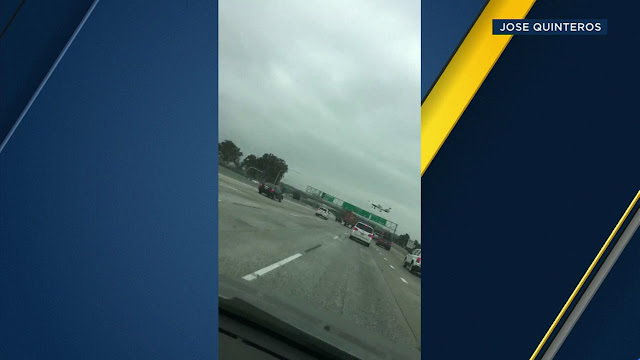 Rondinella encouraged those heading to John Wayne to avoid the 405, which he said as of 1 p.m. was backed up for about 8 miles in both directions. The FAA record for the plane's tail number indicated it was a 1975 fixed-wing Cessna 310R registered to a Santa Ana company called Twin Props. The plane is capable of carrying up to six passengers. It was based out of John Wayne Airport, according to Rodinella. Reading flightaware, this AC just had airwortiness done 28 JUNE 2017. One lighting pole away from landing. Good job I'd say. "Good job".... You're kidding right? ATC recordings indicate he had a right engine failure. Zero reason that aircraft shouldn't have successfully landed at the airport. According to FAA press release -- short of Runway 20R as the aircraft was inbound to KSNA. He was attempting to return to to airport. I have enough 310 time to say that there's no reason one good engine, with just two passengers aboard, shouldn't be enough to get you back to a landable runway, particularly if you don't try to "gain altitude" to put the gear down. Leave it up. Land on the belly--no big deal--and award the airplane to your insurance company. Leave 'em up makes sense, but he still had to get around freeway sign and a light standard. Additional, turning on final with engine out side of plane. Question - just what should the single engine rate of climb (temp mid 70's) be for a 310R with two onboard (assume full or near full tanks)? . . . 200/300 fpm? God bless you, John Meffert. So what's the problem with the aircraft landing on the freeway? Afterall, it was a Mayday declared emergency. From the pics it's clear that the right engine was not feathered. He didn't "land" on the freeway, he crashed. If he was making an emergency landing on the 405 he wouldn't have been perpendicular to it and crashed into the concrete guard wall. Also, to the one who said he should've made it back just fine, you have no idea what was wrong with the airplane. The engine could have failed for numerous reasons, including physical damage that could affect aerodynamics. A Cessna 310 should be able to fly on one engine. That is the whole idea for having a second engine. I was trying to determine from the pictures if the pilot was able to feather the right prop. Hard to tell. Critical to feather the prop on the bad engine to reduce the drag. Pilot was obviously rusty on his engine out piloting skills. Glad they survived and hope they recover from their injuries. From the photos, neither engine was feathered. From the raw video, right engine appeared to be developing power, while the left engine was turning, but without power. Also, confirming from the bend angle of the prop blades after the prop strike. Feather the left engine, climb straight ahead! I owned a Cessna T310C for 19 years. These planes are complex to the extreme for small twins. They handle well in the right hands, but mismanaged in an emergency they are unforgiving. Any updates on the Mrs? I was wondering how she's doing. I hope the couple are ok. They're not out of the woods yet. Definitely keeping them in thoughts and prayers. There have been 60+ aircraft accidents at or near KSNA in the last 35 years. 15 fatal. A miracle that no one got killed with this disaster. If right engine was FULLY SHUT DOWN, feathering would be engaged (minimizing air resistance right prop) unless (right) engine was successfully restarted with positive oil pressure prior to or during final. From Google news, looks like the LA Times posted the wrong photo. The plane is upside-down and a single engine. It's a Cessna 152 from June 1998 -- the LA Times news article is a summary of various plane crashes in Orange County. Navy pilot with multi-engine recip and turboprop experience. I saw the video of the approach of the 310. The pilot was at 20+ degrees angle of bank, dirty, AND turning into the failed engine. From the perspective of the video, I couldn't tell for certain but I consider it highly likely he dropped below Vsse and side-slipped onto the freeway. I have never flown the 310 but have flown civilian twins with marginal single engine capability. I do know if you are flying with one out and have limited single engine capabilities you 1.) Avoid turning into the dead engine, 2.) Avoid high angle of bank turns and 3.) You don't dirty up the airplane until the field is made. This pilot ignored all of these. Can't tell if the right prop is feathered ? I really hope these people recover and live a great life. That being said, the pilot did many things wrong. #1 He panicked, you can hear it in his voice. #2 Turning into a dead engine with a 45 degree angle of bank on short final to the crash. #3 And this is where I normally don't speculate, but from the photos, the engine was obviously turning due to an unfeathered prop. While I am not going to be a liberal and try to put regulations on him, I will say I really wish people would understand what they are doing and have an appropriate response to anything life throws their way. The problem you have with private pilots is they have really no desire to fly or learn like professionals do. Before I get berated, I am not talking about the PPL certificate, but the pilots who think that after a 100 hours or so, they can do and handle anything in aviation. Believe me, I've seen a lot of them. Coming from a 30-year pilot. We need more people like Capt. Meffert in the world; not a punk who leaves snarky comments. All of you are all entitled to an opinion that sometimes reveals the ignorance of, or back-biting capability of some. If you want to back-bite, then have some self-respect and do not remain anonymous. There are situations where following procedures to the letter will not prevent a crash. A feathered prop will likely continue to turn (slowly). Turning back to a runway with whatever you have left for propulsion (or glide) may require you to turn into the wind for best reverse alignment regardless of what engine is out. Turns of more than 30 degrees bank approach the category of steep and raise the stall speed accordingly, confer with the specific POH. Even if my aircraft was recently given a thorough annual, 100hr inspection, or a 50hr oil change the possibility of immediate engine or control failure is always there. I have listened to an experienced 310 pilot who says even when lightly passenger loaded but likely at or nearly full of fuel, the 310 will not climb on one very good engine. You are already on the descent. Whether I had 64 hours at my first check ride or at the current level of total experience that I am fully capable of hesitation due to the realization of a dangerous moment. The point is to get back into the game quickly and make wise trained decisions with whatever you have left to work with. Most emergency situations can be, and wisely should be practiced regularly. One that is not allowed is cutting an engine totally off immediately after takeoff. Reducing power and feathering yes, but not complete shutdown. It is new ground to be put into that situation and the outcome is uncertain, regardless of procedures or experience. Based upon the amount of continuous texting I see while driving I prefer to travel by personal airplane. Texting while driving is proven to be equivalent to drunk driving. I think you know the experience. Today my wife and I air-toured the eastern shore of Virginia and flew for three hours with a stop in Melfa (KMFV). I did not do any engine-out simulations with her on board and followed all procedures and rules. We crossed the Chesapeake at 8500 feet to be sure to avoid landing in the water if an engine-out occurred. Despite everything, a mishap could have happened to us in our single and you would be reading about in Kathryn's Report. You do your best and sometimes you still cannot control what happens. My thanks to people with courage like Capt Meffert and the unnamed others who faced danger too and cared enough to help. It's difficult to tell whether the right propeller was feathered. There is a picture early in the list of photos, with a station ID banner, time and temperature, that seems to show the right propeller feathered. It's difficult to tell because the blades are clearly twisted. Both propellers show curling of the tips indicating that both propellers were turning at the time of impact. The first comment in this thread brings up an interesting point that the certificate issue date for the airplane was nearly coincidental with the accident date. A dangerous tactic by the pilot, if he in fact had no power. He's very lucky he didn't kill himself, his wife and many people on the ground. OK folks, dwell on this for a moment. When was the last time this pilot practiced emergency procedures, specifically engine failure on take-off? Was it in the 310? FTD? Last week? Last month? Last summer? Last flight review? Did this pilot brief the take-off and was he ready for the engine failure? Multi-flying is stressful and dangerous. All it takes is one time you let your guard down and god-forbid a situation occurs. My point is that I would say a new 310 pilot with 20 hours of quality training will do a much better job in an emergency situation than a 10 year 310 pilot that is complacent. So, it doesn’t matter how much time you have in the 310. The question is, are you ready physically and mentally to take the chance? The heat produced by those engines is enormous, and unless you fully understand the mechanics and physics going on, you are very vulnerable. I have taught many folks to fly a 310. I have also told some not to continue training because I thought they were not ready for the enormous responsibility flying the 310. Great airplane, but must be treated with loads of respect! ATP, CFI, Air Carrier, 20K hrs. and 38 plus years of flying. The people who helped get the couple out of the plane are heroes. 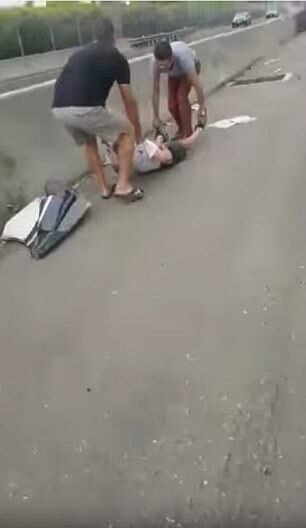 The people who stood by and just filmed the incident are zeros. One mistake after another. I have 1,000+ hours of C310R time. Clearly the pilot was ill prepared. Procedure is straightforward: 1) Reduce Speed to Blue Line, 2) Identify Dead Engine, 3) Verify Dead Engine, 4) Feather Dead Engine, 5) RAISE THE DEAD --- NEVER bank into dead engine. Pilot is lucky he didn't end up inverted. The NTSB is going to have a field-day. 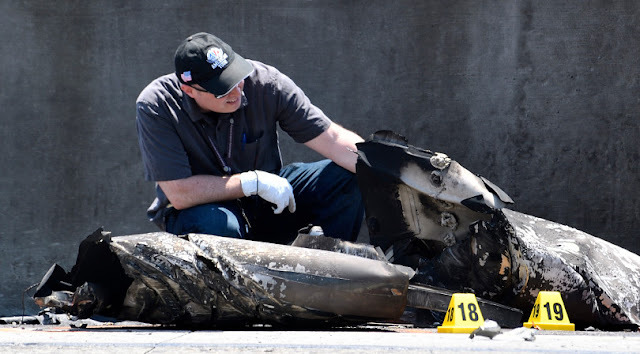 It is truly rare for the NTSB to have detailed videos to use in the accident investigation. Rest assured, the FAA will require the pilot to obtain more training. Better read your POH again as you forgot some critical first steps. Also, NEVER bank into a dead engine is BS. How do you propose to level the wings after banking into the good engine...roll all the way over? This is a stupid comment. How many hours do you have? Are you even a pilot? For the sake of argument, I’ll add one condition. NEVER bank into a dead engine when wing are near parallel with horizon! There you go Gomer, go back to your flight simulator. One last thing, I’m NOT even a pilot, but even I know this. I’m not even a pilot, but this is, was, and will remain the best description of the event that takes place. The outcome was a predictable and natural result from the mistakes the pilot made. I’ll bet the final NTSB report cites “pilot error, failure to maintain situational awareness during a manageable emergency situation”, or something similar. It's not a stupid comment (never banking into a dead-engine is BS). Yes, I am a pilot... ATP (got it in a C310R), Flight Instructor, Chief Pilot in a twin Cessna 135 Charter Operation, FAA Check Pilot for our certificate. 5,200 hours... most of them on 135 ops in twin Cessnas. If you would like to discuss the aerodynamics involved, as well as my practical experience banking into dead engines with the FAA on board during 135 checkrides, giving checkrides in the the C310 I'd be happy to elucidate.